Ideally suited for use in dusty and dirty environments, RTM Series™ cartridges replace failed or clogged multi-stage pumps, minimizing downtime and maximizing productivity. Unlike multi-stage cartridges, Vaccon's single-stage cartridges allow dirt, dust and debris to pass through the pump without clogging. RTM cartridges thread directly into existing multi-stage vacuum pumps and vacuum grippers for immediate, reliable, trouble-free operations. Vaccon's RTM Series is directly interchangeable with multi-stage cartridges, eliminating the need to retool existing production equipment. 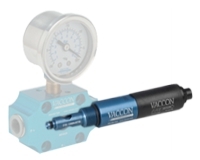 Simply remove the threaded multi-stage cartridge and screw-in the Vaccon RTM single‑stage replacement. Vaccon RTM high performance Mid Series cartridges operate continuously without maintenance, the need for costly filters or cup screens, eliminating downtime, increasing productivity and improving profitability. Looking for a complete modular vacuum pump with a RTM cartridge? Visit the RTM Series Venturi Vacuum Pumps page. Please note that RTM threaded cartridges are not interchangeable with Vaccon (OEM) threaded cartridges. Dimensional data for standard RTM Series threaded venturi vacuum cartridges is presented in 2D drawings, with all critical dimensions and port thread sizes displayed. Both imperial and metric units are included. Performance data for standard Mid Series RTM venturi vacuum threaded cartridges is displayed, listing air consumption, vacuum flow at various vacuum levels, and evacuation times (for 1 cu. ft. or 1 L volumes). Data is presented in tabular and graphed formats, in both imperial and metric units.